For nearly four decades, veteran journalist Prannoy Roy has been crunching election numbers, and blending it with politics to help viewers understand the pulse, language, and arithmetic of elections. 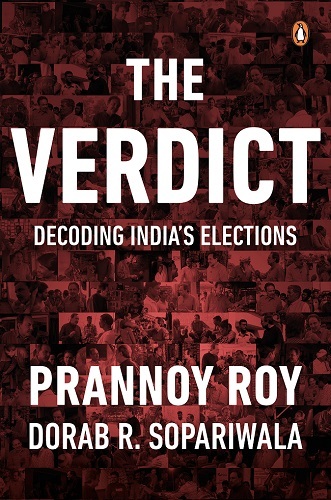 Ahead of the 2019 Lok Sabha Elections, Prannoy Roy, co-founder of NDTV, together with Dorab R Sopariwala, market research veteran and NDTV’s editorial advisor, have published The Verdict, a primer for anyone wanting to decode India’s elections. Covering India’s electoral history, the book looks at a range of factors that can make or break a political party. In an email interview with TNM, author and journalist Prannoy Roy discusses the importance of regional parties in 2019, why 21 million women voters are missing from the electoral rolls, and how the voter today is wiser and more discerning than ever before. In The Verdict, you write that the anti-incumbency era is over in India and the angry voter has given way to a mature and wiser voter. Is anti-incumbency no longer a fear factor for ruling parties if they have a 50% chance of returning to power (as opposed to 70% earlier)? There are two aspects to this question. First, while it is good news for any government that the probability of being re-elected has increased from just 30% of the ‘Anti-Incumbency Era’ to 50% currently, nevertheless even a 50:50 chance of coming back is low by global standards. In the US, for example, the probability of being re-elected is over 80%. “It is no longer a national election but a true federation of state elections,” you argue. Who do you believe will be the kingmakers in 2019? While the national media focuses on Modi vs Rahul and ‘national issues’, the reality on the ground is that local state leaders, regional parties, and local issues are the primary determinants behind the swing in all elections today. The reasons behind the outcome in Tamil Nadu are very different from West Bengal or Andhra or Bihar. The role of regional parties is becoming more and more important for voters: from just 5% of the vote, regional parties today account for 35% of the overall Lok Sabha vote. Yes, these regional leaders are all set to play an important role as kingmakers in 2019. You write about how voters prefer a CM or PM who need not be a flamboyant orator or a charismatic leader. Do you think this is true in 2019 given that Prime Minister Modi has made this election a presidential style election where it is the personality that matters? The book points out that a divided opposition has helped the winning party. Do you think 2019 will be a game changer with political parties coming together to form pre-poll alliances in several states? Winning elections in India is a story of ‘divide and rule’. To win a majority it is becoming less important to win a high percentage of votes than to have a badly divided opposition. During the post-independence period, only one-third of the seats of the winning party were won because the opposition vote was divided. Today, almost half the seats of a winning party are purely the result of a divided opposition. Parties are coming to power with a lower and lower popular vote. The impact of news channels on voting behaviour is overrated, you write. Is this true of Hindi channels and other regional language channels? What about social media? Yes, it is true that we the media – and political leaders too – tend to overrate the impact of media on voter behaviour. Voters are much smarter than we give them credit for. While they do gather information from news channels and other media, but on our hundreds of field trips, we have found that voters discount the biases inherent in different channels and in the end make up their own minds. For example, Sun TV, the most popular network in Tamil Nadu with close ties to the DMK, could not ensure uninterrupted victories for the DMK. Neither could the ownership of TV channels and the cable distribution network in Punjab ensure a victory for the Akali Dal. Just two examples of numerous such cases. The role of social media is becoming crucial in the spread of both news and fake news, particularly among young voters. In every village we visited across the country, the presence of WhatsApp, Facebook, and other social media is almost ubiquitous. Unfortunately, along with all the wonderful positives associated with social media, the most democratic of all media forms, there is also one terrible downside: the dissemination of false messages that incite hatred, creating social tension, and, in many instances, the cause of inter-community violence. And the underlying cause is the anonymity inherent in social media – so nobody can be identified or punished for these violent messages. Participation of women in elections is fast rising and you point out that in 2019 it will be the vote of village women that will be the most important. This, however, has not translated into enough representation of women in politics. This is a tragedy of the male-dominated society that India is today – and it is even more so among many political parties. Not enough candidates are women by a high percentage. However, this may see a change in these 2019 elections. Once again, the voter is ahead of the politician – with the rise in turnout of women voters, more parties are being compelled to nominate more women to change the perception of male dominance in their parties. 21 million women are missing from the electoral rolls. What do you believe are the main factors for this? And what do you believe needs to be done to ensure these women are not missing from electoral rolls? A separate study would be needed to figure out the reasons for the 21 million missing women. The Election Commission (EC) makes great efforts to include all eligible voters in the rolls, but the actual work is carried out by the state machinery. Thus, it could be the inefficiency of the state machinery, or social customs where it is not acceptable to have women photographed or their age revealed, or a combination of these factors that have led to the missing women. But now that the problem has been identified, and it is particularly severe in the Hindi-belt states, the EC needs to make special targeted efforts to ensure that this number is brought down to the absolute minimum. The biggest concern is that it seems likely that most of these 21 million missing women voters are from the poorest sections of the society. The Verdict busts this myth that high voter turnouts mean anti-incumbency. Tell us more your findings. The empirical evidence suggests that low turnout helps cadre-based parties – like the BJP and the CPI(M). This is perhaps because even in low voter turnout elections party cadres ensure that their party supporters do come out and vote. No such efficient turnout management exists in parties like the Congress or other parties.